A Pow Wow is a Native American gathering that was originated to bring many tribal members together in peace and harmony, and to this day this tradition has continued. The tribal members congregate to show support for one another as well as display traditional wares and dance. Also, Native American foods are available for you to sample. For many years, Pow Wows were closed off to the public for various reasons, but now the American Indians welcome anyone who has a true interest in the culture and fellowship. Pow Wows are a great source of learning about Native American culture, and most tribes encourage the public to come. Before attending a Pow Wow, there are several things you should know. Pow Wows have rules of etiquette that should be followed. These rules have been handed down over generations from elders to youth and represent respect, brotherhood, and courtesy for the tradition and life. Every Pow Wow has a “Master of Ceremony.” The “Master of Ceremony” is usually a tribal head or an elder. The job of the “Master of Ceremony” is a demanding one, for it is this person who leads the entire Pow Wow. The “Master of Ceremony” begins the “Grand Entry” where the dancers enter the ring and are seen in full regalia for the first time. This person also has all control of any activity within the Pow Wow and leads many prayers. You should stand and men must remove their hat (unless traditional head gear) during the Grand Entry, Flag Songs, Invocation, Memorial, Veterans Songs, and the Closing Song. At closing, a prayer will be said to send you on your way. The Master of Ceremonies will determine if you should or should not stand during closing prayer. If you are near the arena and dancers are dancing, you should again sit down until the dance is finished. Do not sit within the arena. The chairs inside the arena are reserved for the dancers. Use the outside circle or bleachers if provided. During the Gourd Dancing, only Gourd Dancers and Gourd Dance Societies are to enter the Dance arena. Remember: owning a gourd rattle does not make one a Gourd Dancer. Check with the local Societies. Please do not permit your children to enter the dance circle unless they are dancing. The arena is the area where dancers step lively and show their traditional dancing skills. The arena is in the form of a circle. The reason the dancers always dance within this circle is because the circle represents “The Circle of Life.” Being invited to dance in the circle is the only time a spectator is allowed in the arena. If you want to take pictures, check with the pow wow host first, then check with the person you are taking pictures of and ASK THEIR PERMISSION. Under no circumstances may you enter the arena to take photos. Put your camera down for all memorial dances. All tape recording must be done with the permission of the Master of Ceremonies and the Lead (or Head) Singer of EACH drum. When a new drum starts, do not enter the arena to get to the other drum. Don’t run. Miss the song and wait for the next one to take your time getting to the drum. Nothing is more rude than “Recorder-runners” circling around a drum. Many Pow Wows disallow this anyway. To take a photograph or make a videotape, or make a sound recording, without permission, shows lack of respect for the culture. If you are asked to dance by an elder, do so. It is rude and disrespectful to say, “I don’t know how.” How can you learn if you turn the elders down? Exercise respect during these special times because these are the most sacred times during a Pow Wow. Exercise good judgment at all times. No matter how tempting, do not touch the regalia of any of the dancers. Touching any part of a dancer’s costume shows lack of education for the culture as well as lack of respect for tradition. 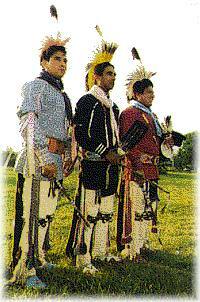 Many of the parts of dancers’ costumes are eagle feathers that have been blessed. If you touch the eagle feathers, the dancer will need to disrobe and have the parts blessed again. In extreme cases, the dancer will not be allowed to dance. Again, the drums are sacred, and it is believed that anyone who takes a place behind the drums has been selected by God to be there. No one drums without special permission, and no one sits in the drumming area without special permission of the head singer. Great offense is taken if you choose to sit in this area. No one will make unreasonable demands; you can count on that. The invitation may be for a simple dance. You should accept all invitations graciously and enjoy yourself. You should never turn down an invitation by anyone, especially elders, during a Pow Wow. If you are not wearing traditional Regalia, you may dance only on social songs (like Two-Step, Blanket Dance, Honoring Songs, Circle, etc..). Sometimes a blanket dance is held to gather money. You may enter the circle to donate. If you want to participate but you do not know the dance steps, most are easily learned and someone will instruct you as you go. Never bring alcoholic beverages, drugs, or attend a Pow Wow under the influence of any such substance. The Pow Wow is a place of happiness and brotherhood so do not spoil it for yourself or others by attending under the influence. Urban Pow Wows are much more “rigid” than a Pow Wow on the rez. As people are away from the comfort of culture, they tend to take things more seriously. Please abide by peoples wishes and requests. Each tribe has their own ways and does things differently. Some dance around clock-wise, others counter clock-wise. If the host asks, dancers sometimes voluntarily show their respect by temporarily changing their way(s). Show your respect by doing the same. There is so much to be learned from a Pow Wow. Remember always that Native American Indian dances are more than the word “dance” can describe. They are a ceremony and a prayer which all life encompasses and produce many emotional and spiritual reactions. Some dances are old, some are brand new… the culture continues to live and evolve. You will indeed be enriched by knowledge of and respect for a culture that is the oldest in this country. You will also reap the blessings that everyone receives from attending a Pow Wow. Please Note: Every POWWOW is different! The key is respect! If you are participating: be respectful by being on time! Enjoy yourself and feel comfortable that no one will make unnecessary demands upon you. Feel free to ask questions; if you need instruction, someone will help you. If you are not wearing traditional regalia, you are generally welcome to be an active dance participant during social songs. Follow the instructions and lead of the Master of Ceremony.Do not join the dance until the leader’s ground members are on the floor. Be aware that it is polite and respectful to ask permission before taking photos, videos or sound tracks. Do not touch any parts of the regalia of the dancers. Never bring alcoholic beverages or drugs, gold paint cans or attend a Pow Wow under the influence of any other such substance. Alcohol and drugs are destroying our way of life and these “bad” spirits are not welcome. Do not participate in any type of inappropriate behavior or purposely offend. It is not the place! Relax and have fun. Donate, if you can. Also , if possible, buy something from the vendors. Make an extra effort to walk to the trash can. No one should have to clean up behind you after you leave. Respect Mother Earth. Leave enriched and feeling blessing. A lot of tribes don’t have a word for “art” in their language because it is so much a part of their culture. 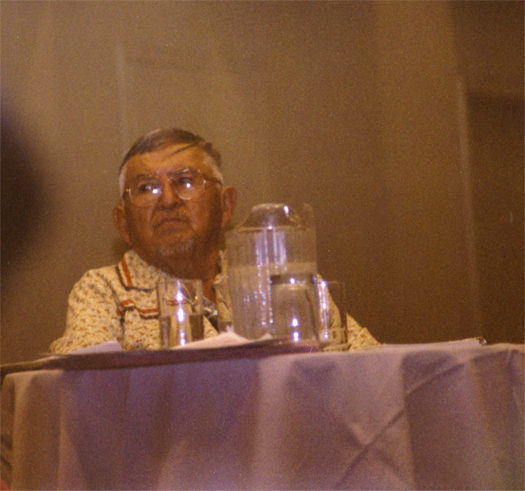 These are photos I took when I had the pleasure of hearing Allan Hauser speak at the Red Earth breakfast in 1988. One of the finest artists of our times. 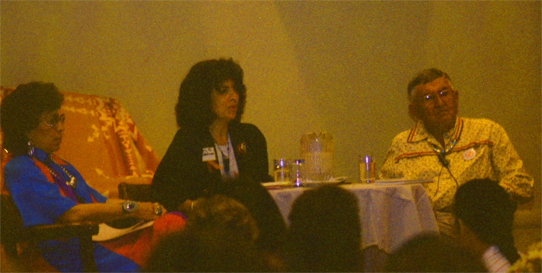 Mary Jo Watson (Center) sits with Allen Houser at the breakfast. Born on June 30, 1914, Allan C. Haozous was to become known as Allan Houser, one of the 20th Century’s most important artists. Allan’s parents, Sam and Blossom Haozous were members of the Chiricahua Apache tribe who were held as prisoner’s of war for 27 years. Allan’s father was with the small band of Warm Springs Chiricahuas when their leader, Geronimo, surrendered to the U.S. Army in 1886 in the northern Mexican state of Chihuahua. In retribution for the Warm Springs Bands’ refusal to leave their lands in New Mexico and relocate to a reservation in Arizona, 1200 Chiricahuas were sent by cattle-car train to prisons in Florida. Allan’s father was among the women and children jailed at the Castillo de San Marcos in St. Augustine, Florida, and Allan’s mother was born in the prison camp at the Mount Vernon Barracks, Alabama where surviving members of the tribe were sent in 1887. As a final solution, the last of the Chircahuas were sent to Fort Sill, Oklahoma where they remained captives for 23 years. Freed at last in 1914, a majority of the tribe returned to New Mexico to join with the Mescalero Apaches for whom a reservation had been created. 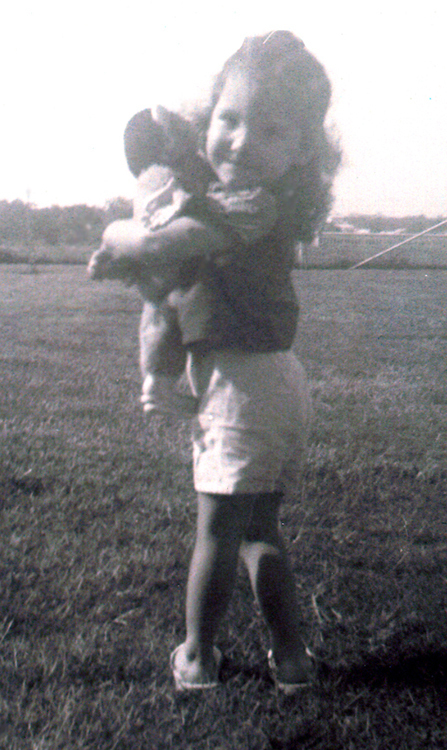 Allan’s parents, however, were with a small group of families who chose to stay in Oklahoma and create farms in the Apache and Lawton communities. Allan was born just months after their release, the first child born out of captivity. Growing up on the farm, Allan labored with crops of cotton and alfalfa and helped support the family growing vegetables and raising livestock and horses. At an early age he became interested in the images he saw in magazines and books. 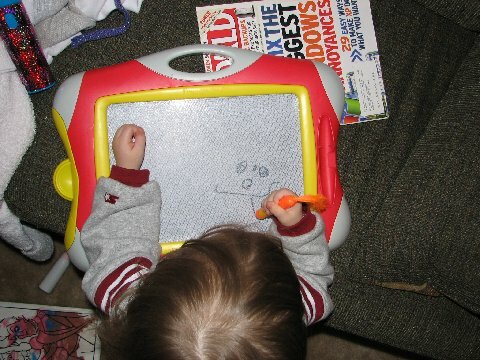 He soon began making his own drawings and carvings. In 1934 a notice for an art school in Santa Fe attracted his attention, and he enrolled in the Painting School at the Santa Fe Indian School. Commonly known as the Dorothy Dunn School after its prominent teacher, Allan became its most famous student and by 1939 his work was exhibited in San Francisco, Washington D. C., and Chicago. In the same year he received a commission to paint a mural in the Department of Interior building in Washington, and its success led to a second mural commission there in 1940. In 1947 Allan was commissioned by the Haskell Institute in Lawrence, Kansas, to do a memorial sculpture honoring the Native American students from Haskell who had died in World War II. Completed in 1948, this work entitled “Comrade in Mourning” was his first major marble carving. In 1951 Allan moved to Brigham City, Utah, where he taught art at the Inter-Mountain Indian School for the next eleven years. 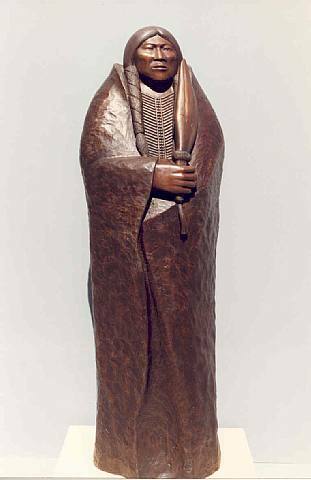 He continued to paint and produce small wooden sculptures, and in 1954 he was honored by the French government with the Palmes d’Acadamique for his outstanding achievement as a teacher and artist. 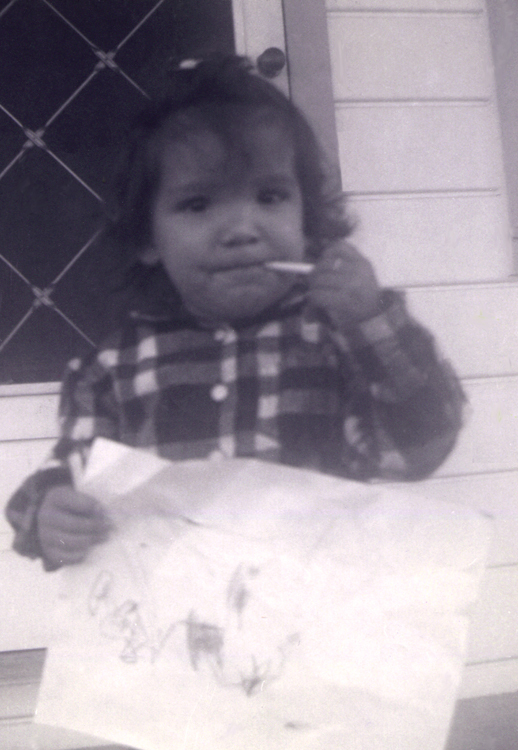 In 1962 Allan was asked to join the faculty of the newly created Institute of American Indian Arts in Santa Fe. There he created the sculpture department and began focusing his own artistic output on three-dimensional work. As he taught and created sculpture he began integrating the aesthetics of the modernists with his narrative ideas. 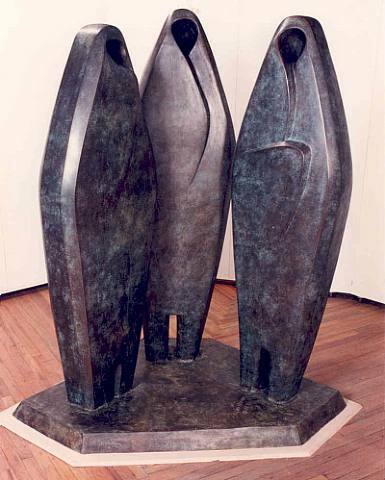 By the late 1960’s he began exhibiting this sculpture and recognition of his unique style grew. Museums and private collectors sought out examples, and his influence became apparent on hundreds of students and other artists. 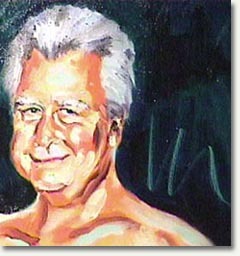 In 1975 Allan retired from teaching to devote himself full-time to his own work. In the two following decades he would produce close to 1,000 sculptures in stone, wood, and bronze, and emerged as a major figure on an international scale. He had nearly 50 solo exhibitions in museums and galleries in the United States, Europe, and Asia, and he continued working tirelessly until his death on August 22, 1994. This is an original and treasured artifact from the Nevaquaya family. featured on the incredible 100 year old Buffalo skull. A Pow Wow I’ve enjoyed through the years… you should check it out! 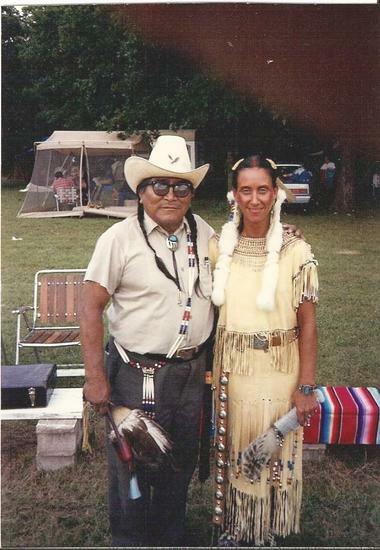 Every year since the club’s organization, the Kihekah-Steh Pow-Wow has been held to remember with honor Chief Ki-He-Kah-Steh and all service men. The Annual Pow Wow is generally held toward the end of July, and is a three-day celebration. Do not join the dance until the leader’s ground members are on the floor. Address: The dance grounds are located 5 miles north of Hwy 20 on Javine Hill Rd, then west on 193. Bert Seabourn sneaks us into Chambord Castle… by whistling…. Read about the castle (which is actually a chateau….) that Bert helped sneak us into! The Chateau of Chambord in one of the loveliest Renaissance buildings in the Valley of the Loire. Chambord, chateau, park, and village in the department of Loire-et-Cher in central France. The chateau of Chambord was a retreat for French kings, especially Louis XIV It was under his auspices that French dramatist Moliare’s Monsieur de Pourceaugnac and Le bourgeois Gentilhomme were first produced there. Building of the chateau was begun by Francis I in 1519, and was completed in 1547. Florentine artist Leonardo da Vinci paid a short visit to the building during its construction and added a few embellishments to it. The structure, containing 440 rooms, 365 fireplace, 13 great staircases, and stables to accommodate 1200 horses, stands in a park surrounded by a wall of 22 miles in circumference. 1800 men worked on the chateau. The archives offers us no information as to the name of the architect but an analysis of the structure reveals a profound influence of Leonardo’s thought and a extremely close tie to some of the projects by Domenico da Cortona, and Italian architect. Te staircase is related to a project by Leonardo which consisted of four distinct superimposed flights of stairs, in order words, just as many stairs as quarters and arms of the cross of the castle. It is therefore likely that Leonardo da Vinci staircase, which may have been conceived for Chambord, was then simplified when it was built by the master masons of the building yard. The archives offer us no information as the name of the architect but there is influence of Leonardo de Vinci and close tie to some of the projects by Domenico da Cartona , and Italian architect. The spiral staircase derives from a medieval concept. it goes far beyond it in its unique division into two separate flights with numerous openings on the arms of the corridors. A tribute to the former medieval French tradition is to be found in the presence of powerful cylindrical towers at the corners of the keep. The top of the stairs leads to the large terraces of the castle. After Francis I death in 1574 the castle was practically unused for about fifty years. After having passed through other hands, the chateau risked being demolished after the Revolution and in 1793 the furnishings were dispersed. In 1947 the State began restorations which were continued for 30 years. Construction of Chambord castle took more than a quarter of a century. Started in 1518, work was interrupted in 1525 when the coffers of the Kingdom were completely empty, and didn’t resume until October 1526. From that date on, you could find up to 2,000 workers on the site at any given time. Having given up the totally unreasonable plan of rerouting the river Loire to bring it to the foot of his castle, the castle, completed in 1547, contains 440 rooms, 84 staircases, 365 fireplaces (one for each day of the year). It also has stables to accommodate 1,200 horses. The property is surrounded by 20 miles of walls which protect more than 13,000 acres of woods. This huge hunting reserve covers as much ground as all of Paris! The initial wooden model of the Chambord castle, which no longer exists, was attributed to an architect known as ‘le Boccador’. However, the name of the actual project architect remains a mystery. The plan suggests both French medieval architecture with its typical cylindrical towers at the corners of the castle, and the influence of Italian Renaissance architecture, specifically that of the Italian architect Domenico da Cortona. Leonardo da Vinci as well is thought to have participated in the design, as one of the master rooms of the castle is attributed to him. It houses a double spiral staircase, with each stairway superimposed on the other so that two people can climb or descend simultaneously without ever having to meet each other. Some say it was designed so that kings wouldn’t ever have to cross paths with servants, others say that one staircase was for the king’s wife and the other for the king’s mistress. The overlapping staircases are located at the intersection of 4 huge rooms forming a cross. Crowned by a 125 ft high lantern, they lead to a magnificent rooftop terrace. In her time, Catherine de Medicis, a passionate of astrology, would often climb to the lantern and consult the stars. What did Leonardo da Vinci do in the castle ? Leonardo was a great artist and scientist. He painted many famous paintings and invented ingenious appartus. He was born on 15 April 1452 in Vinci. His father was a notary (Piero Da Vinci) and he had 18 brothers and sisters. In the begining, in Florence, he learnt painting, stonecarving and drawing in Verrochio’s studio in 1470. He liked mathematics and music too. When he was 16 years old, Leonardo went to Milan, Mantoa, Venice, Rome where he perfected his art. Later, he came back to Florence and he met Michel-Angelo. Eventually, he stayed again in Milan, then in Rome where the great artist of the time was Raphaëllo. Finally, Leonardo, desillusioned, accepted François I’s invitation in 1516 to come to France where he spent a peaceful end of life (in Clos Lucé, near Amboise ). First, we know that François I met Leonardo in Italy and he was impressed by his work of art. The king wanted Leonardo as his first architect and the artist accepted François’s invitation. So, he arrived in France in 1516. He lived in the Clos Lucé, in Amboise near Chambord. Finally, a keep plan and a church plan by Leonardo were found which resembled Chambord’s layout a lot. The staircase in the church plan looks very much like Chambord’s double spiral. This plan is our only indication for Leonardo’s participation in the castle’s architecture. The central staircase which is in the middle keep is the most famous French Renaissance staircase. This staircase has a majestic architecture : a double spiral winds around a hollow centre so that two people, going up or down can never meet. A beautiful lantern stands above of the staircase. The Chateau of Chambord in one of the loveliest Renaissance buildings in the Valley of the Loire. It was a retreat for French kings, especially Louis XIV. It was under his auspices that French dramatist Molière’s Monsieur de Pourceaugnac and Le bourgeois Gentilhomme were first produced there. Building of the château was begun by Francis I in 1519, and was completed in 1547. Florentine artist Leonardo da Vinci paid a short visit to the building during its construction and added a few embellishments to it. The structure, containing 440 rooms, 365 fireplace, 13 great staircases, and stables to accommodate 1200 horses, stands in a park surrounded by a wall of 22 miles in circumference. 1800 men worked on the chateau. The archives offer us no information as the name of the architect but there is influence of Leonardo de Vinci and close tie to some of the projects by Domenico da Cartona, and Italian architect. The spiral staircase derives from a medieval concept. It goes far beyond it in its unique division into two separate flights with numerous openings on the arms of the corridors. A tribute to the former medieval French tradition is to be found in the presence of powerful cylindrical towers at the corners of the keep. The top of the stairs leads to the large terraces of the castle. After Francis I death in 1574 the castle was practically unused for about fifty years. After having passed through other hands, the chateau risked being demolished after the Revolution and in 1793 the furnishings were dispersed. This one has some great diagrams of the staircase! Check it out! A double spiral staircase consists of two staircases that spiral around one another so that two people can pass each other without meeting. Figure II shows Leonardo da Vinci’s double spiral staircase in Château de Chambord in the Loire Valley in France. The construction of the castle began in 1519 (the same year that Leonardo da Vinci died) and was completed in 1539. In Figure III we see a model of the staircase where we can clearly see the two staircases spiraling around one another. The double spiral staircase has, with its simple yet surprising design, fascinated and inspired many people. We quote here from Mademoiselle de Montpensier’s2 memoirs. “One of the most peculiar and remarkable things about the house [the castle at Chambord] are the stairs, which are made so that one person can ascend and another descend without meeting, yet they can see each other. Monsieur [Gaston of Orléans, the father of Mademoiselle de Montpensier] amused himself by playing with me. He would be at the top of the stairs when I arrived; he would descend when I was ascending, and he would laugh when he saw me run in the hope of catching him. I was happy when he was amused and even more when I caught him.” Leonardo da Vinci had many ideas for designs involving double spiral staircases. Two of his main interests were water flow and military instruments. For Leonardo everything was connected, from the braiding of a girl’s hair (see for instance the famous drawing of Leda and the swan) to the flow of water (which also exhibits a double spiral behavior when it passes an obstacle like the branch of a tree). He designed water pumps that were formed as double spiral staircases that supposedly would pump more efficiently than the more standard Archimedean pump then in use. He designed fire escapes formed as double (and greater multiples) spiral staircases where each staircase was inapproachable from another, thus preventing the fire from jumping from one staircase to another. That they spiraled together made them very space efficient. This basic design idea for fire escapeshas become quite standard; for example, both the fire escapes in Fine Hall at Princeton University and the fire escapes in New York University’s Silver Towers use this idea. Here are some of the other artists who were selected for and traveled for the 1992 Group Exhibition @ the Franco-American Institute in Rennes, France. They are all incredible artists and it was a blast spending that time with them. 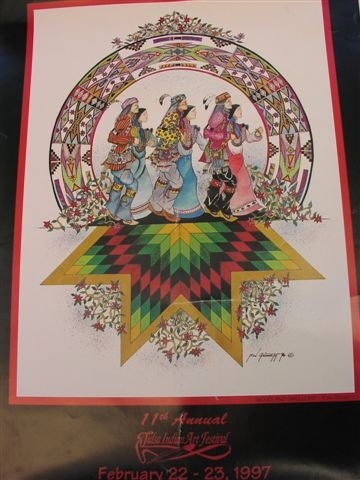 2005 POSTER ARTIST FOR SANTA FE INDIAN MARKET! 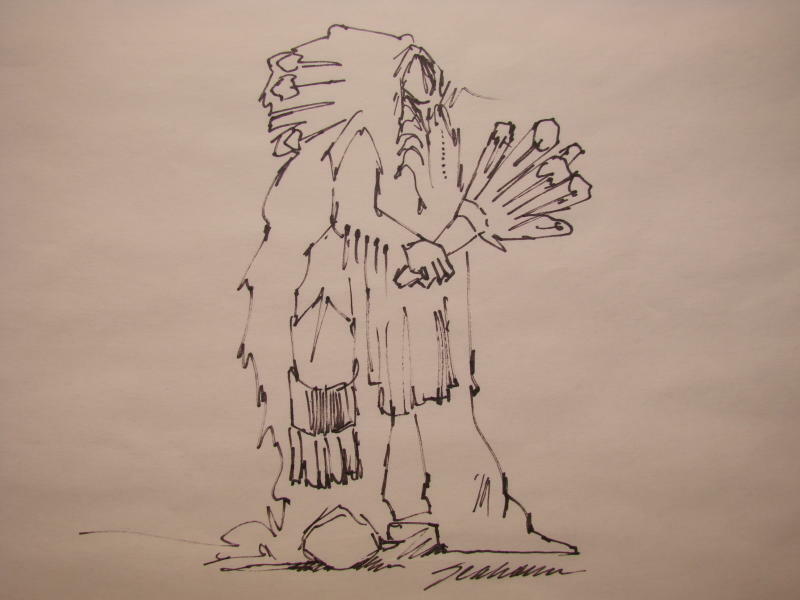 Considered one of the nation’s leading Native American artists, Benjamin Harjo, Jr. is a Seminole-Shawnee whose formal education includes two years at Santa Fe’s Institute of American Indian Art and a BFA Degree conferred by Oklahoma State University in 1974. 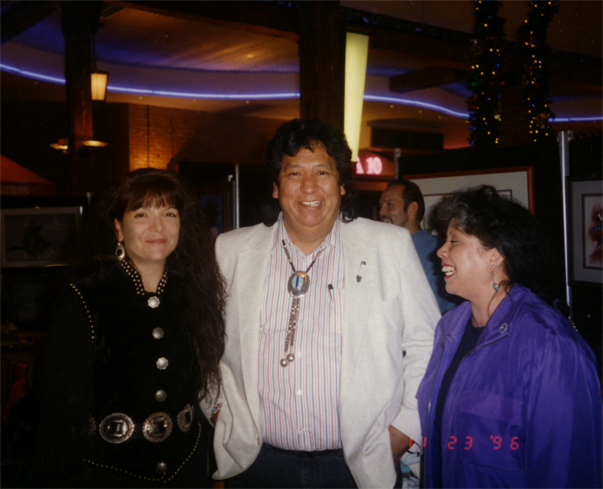 During a career spanning over twenty years, Harjo has garnered numerous honors and awards including the 1987 Red Earth Grand Award, the 1993 Heard Museum’s 34th Annual Featured Artist, the Featured Artist in 1992 and 1993 for the Smithsonian’s National Museum of the American Indian’s Annual Aspen Benefit and the Gold Medal Award at the 1990 American Indian Cowboy Artists Wichita Show. Additionally, Harjo was honored with a commendation by former Oklahoma Governor David Walters for his selection by Absolut Vodka to represent Oklahoma in its USA Today campaign. 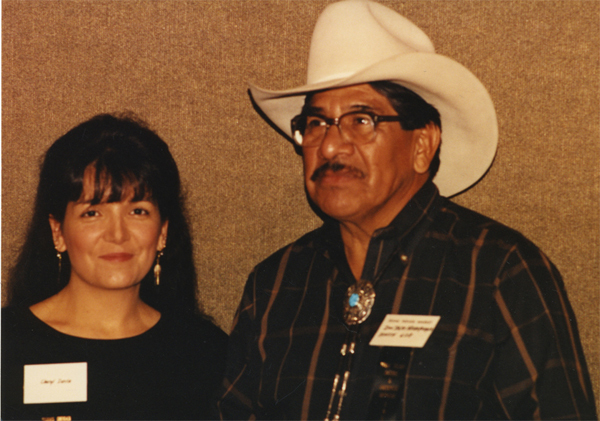 In 1990, he was the recipient of the Woody Crumbo Memorial Award for Excellence in Painting at Santa Fe’s Annual Indian Market, an event where Harjo has consistently received Best of Division and first place awards in various categories since 1983. One-man museum shows include the Wheelwright Museum Skylight Gallery and the Wichita Art Museum in 1991. 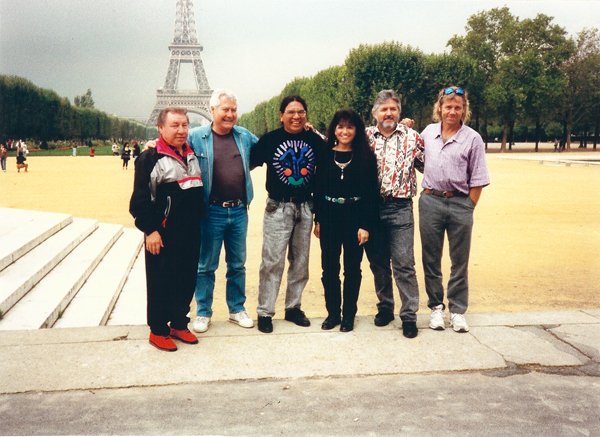 Harjo also participated in the 1992 group show of Native American artists at the Franco-American Institute in Rennes, France. 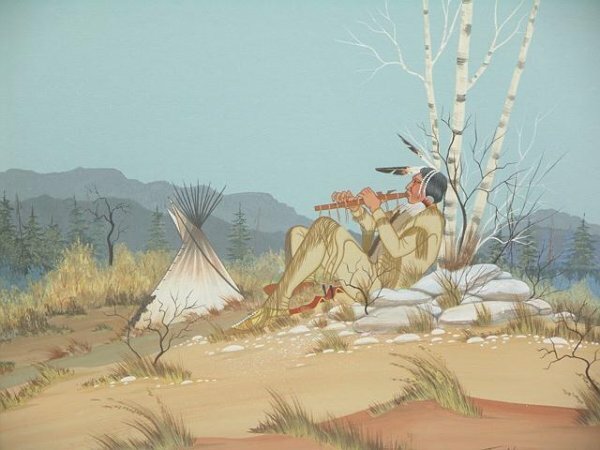 His work has been featured in numerous regional and national publications including Art of the West, Oklahoma Today, Southwest Art Magazine, American Indian Art, and Indian Market Magazine. Harjo paintings and graphics have been privately collected throughout the U.S. and abroad and featured in public collections such as the Fred E. Brown Collection at the Oklahoma Museum of Natural History and the Red Earth Center. 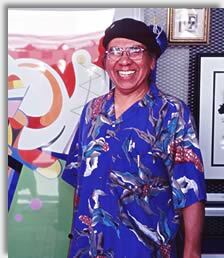 This talented and prolific Cheyenne Arapaho artist, has earned over 400 awards, including one from the Indian Arts & Crafts Association for “Lifetime Achievement”. Charlie is also the only artist to be named “Artist of the Year” in two consecutive years, 2003 and 2004. As the boy watched the river flow, his future appeared before him. He listened intently as his grandfather spoke. he watched closely as the old man’s hands worked the riverbed clay. The people and animals born from sharp eyes and a skillful touch moved the boy. His heart was drawn to the power of sculpture. The boy’s soul was filled with inspiration. To this day that inspiration pours forth like the river . . . This is the story of Charles (Charlie) Pratt, a self-taught artist who is called a wizard and a genius by his peers. Pratt’s reputation is known throughout the world because of the great breadth of his work and the incredible depth of each individual piece. Using his Cheyenne-Arapaho heritage as a guide, Pratt breathes a unique brand of Native American poetry into his creations. 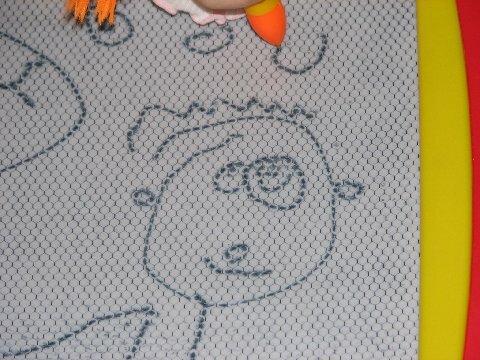 Charlie’s art is not bound by any particular medium or scale. He molds large, small and even miniature sculptures out of cast bronze, metal and stone. Striking color and texture are added with his skillful use of silver, precious stones such as turquoise, and semi-precious stones including coral and malachite. He is always anxious to add new techniques to his already extensive arsenal, which include even non-traditional methods such as acrylics, fiberglass and dichroic glass. Even though Pratt’s work is wide ranging, his distinctive style is obvious to those familiar with Indian sculpture. Many museums, state, and federal buildings are showplaces for his commissioned sculptures. For more than forty years now, Charlie has competed in museum, fine art, and invitational shows throughout the United States. He has won over 400 awards, including top honors such as “Best in Category”, and “Best of Show”, many times. 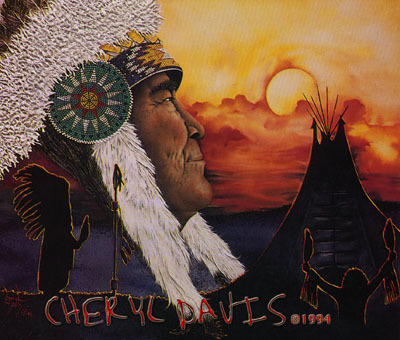 His latest acknowledgements provide new career highs: 2002 brought a “Lifetime Achievement” award from the Indian Arts and Crafts Association (IACA), and he was chosen as “The Honored One” for the 2002 Red Earth Festival in Oklahoma City. 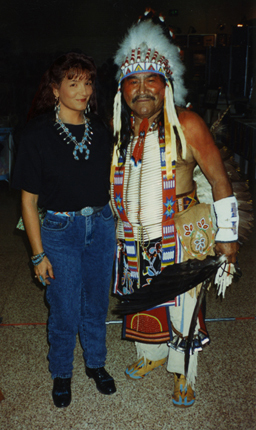 In 2003 the Gallup Inter-Tribal Ceremonial named him their “Ceremonial Living Treasure.” In 2004 the IACA again named him “Artist of the Year”, an award he also received in 1985, making him the first in IACA history to receive the honor twice. Denny Haskew currently resides in Loveland, Colorado where he is actively engaged in the art industry as a sculptor. In 1971 he received his degree from the University of Utah, and then served two years in the United States Army during the Vietnam War. Haskew has received a lot of publicity and attention for a man who didn’t start sculpting until he was 38 years old. Before art came into his life, Haskew spent his winters teaching cross-country skiing. He spent his summers as a white water rafting guide in the Grand Canyon and on the Salmon River in Idaho. Denny has learned to love the rivers and mountains of the western states of Arizona, Colorado, Idaho, Oregon, and Utah. During a trip to visit his parents in Loveland, he fell in love with bronze. Thus in August of 1985 began Haskew’s education in the world of bronze. He wasted no time in getting monumental sculpture experience through working with renowned sculptors including Fritz White and Kent Ullberg N.A. Since 1987, Denny has created and placed many monumental compositions; spanning the full spectrum of the figurative genre. 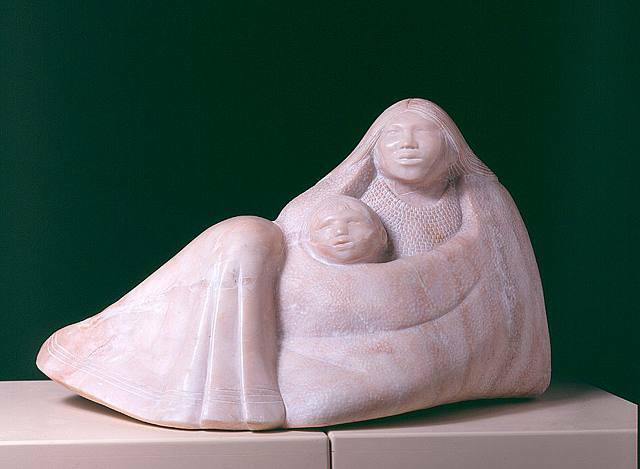 As a member of the Potawatomi Citizen Nation, it is only natural for his artwork to follow the Native American culture. Haskew’s work conveys his innermost being. It is intensely personal and honest. His themes are recurring: spirit, healing, love, forgiveness, relationships, endurance, the sacredness of the human spirit, the strength in each of us and the power of all that is natural. Bob Thomason (Cherokee) credits his growing up in Oklahoma, once known as Indian Territory, and his Cherokee heritage as major inspirations to his desire to preserve the folklore and history of America through his paintings. From the Native American subjects, Bob continues to capture the rare qualities of this country’s rich heritage in such a way as to draw growing public acclaim. Balancing his work between the past and the present makes Bob realize that same human spirit of another time is still alive today. Bert Seabourn exhibits throughout the United States and has shown his art in England, Germany, France, Russia, Taiwan, Singapore, Chile, Bolivia, Peru, Colombia and Ecuador. His work is not only in private collections worldwide, but is in many public collections including The Vatican Museum of Religious Art, The American Embassy, London, The National Palace Museum of Taiwan, Smithsonian Museum of Natural History, Washington, D.C., The National Cowboy and Western Heritage Museum, Oklahoma City, President Ford Library, Oklahoma City Museum of Art, and The President George and Barbara Bush Collection. Seabourn’s best-known works provide us with a dream-like glimpse into the souls of all living things, in a spiritual, impressionistic style. His paintings depict the things he loves, such as women holding babies; wise, old men; the four-leggeds as story tellers; and the birds as messengers. He shares with the viewers some special moments, possibly in a new light, like lovers walking along the bank of a rusty creek or among the persimmon trees; lovers galloping off “in the fast lane” toward a passionately red sky; or children who still remember how to talk with the animals. He paints the healers and mystics, the ones who care for our bodies and souls. Sometimes these shamans are painted with serious reverence and sometimes with Seabourn’s characteristic sense of humor…he has been known to paint the shaman carrying his “medicine” inside a martini glass, complete with olive. Whatever the subject, Seabourn’s work does provide our world with more art, love and magic! 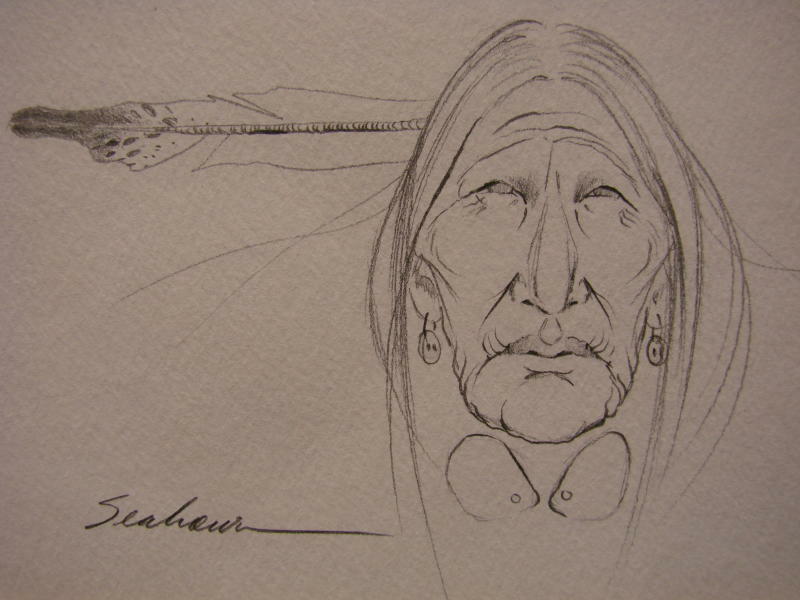 Seabourn was making art from a very early age, and his first cartoon sale was at the age of thirteen. He continued to draw and paint at every opportunity. As a teenager, when he would hear of an art show in a city of any “reasonable” traveling distance, he would “hop a train” and be off to see the exhibit. 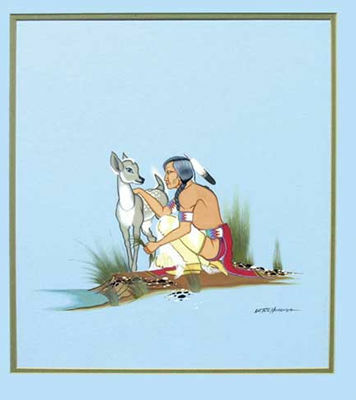 An exhibit at the Center of the American Indian (now the Red Earth Museum at the same location), Kirkpatrick Center, in the Omniplex in Oklahoma City, featured a gathering of his works from 1947 (a watercolor of two deer) through 1982, an exhibit which spanned 35 years. My first European tour rates as one of my favorites. 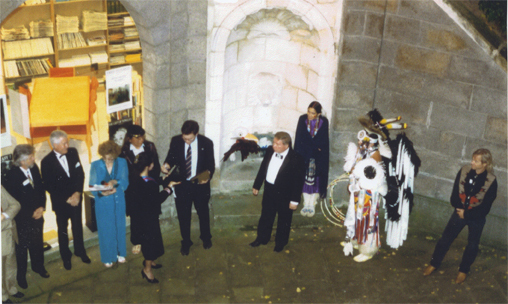 Bob Thomason (artist); Bert Seabourn (artist); Shirley Wells (previous Sapulpa (Oklahoma) Indian Territory Gallery owner and show organizer – now deceased); Cheryl Davis (front – artist, presenting gift from the State of Oklahoma); Benjamin Harjo (artist); Official, name unknown (official of the Institute or City); Charles Pratt (artist); female dancer from Oklahoma, name unknown; Mike Pasatopah, hoop dancer from Oklahoma (I need to check the spelling of his name); Denny Haskew (artist). MORE DETAILS TO COME…. Check back in! The Franco-American Institute in Rennes: Last Remaining Bi-national Center in France. The Franco-American Institute is a bi-national center founded in 1961 by the American Embassy in Paris and the City of Rennes in order to strengthen the friendship and mutual understanding between the United States and France, we continue to propose cultural exchanges between our two countries which are at the very heart of our association’s activity. Serving as representatives of the United States in Western France, we allow people of all ages and social backgrounds to discover the many facets of American culture. Art exhibits, conferences, plays, language courses, music recitals, an American library, and cultural exchanges, proposed by the Institute give Americans and the French the opportunity to meet, acquire first-hand information, and exchange views in a positive atmosphere of mutual respect. The Institute is located in two buildings in the center of Rennes. The Institute offers a broad range of cultural activities, including a reference and lending library, concerts, art exhibitions, midday and Sunday morning concerts, conferences, a student exchange program, American English courses a translation service…. The American Friends of the Franco American Institute is a tax qualified non-profit organization created in 2004 to support the work of the Franco American Institute based in the Northwest Region of France. The Franco American Institute is the unique bi national center founded in 1961 by the US Embassy in Paris and the City of Rennes, France to promote mutual understanding and diffuse American language and culture. As an American diplomat recently stated “there are many more areas of agreement than disagreement between the French and the Americans” and the Institute is there to promote better understanding between the two peoples. For many years, the Institute has promoted comprehension through exchanges, cultural and language courses, conferences, an American library and many other programs. Powerful words, don’t you think? HOW WOULD YOU CHANGE IT TO READ?